We define together the task ist and the frequency of our visits. We can adapt our ration depending on the passage frequency. 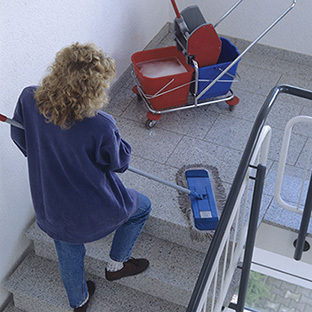 This cleaning service is for syndicates and or unions, owners, associations of co-owners, renting agents in Brabant-Wallon and Brussels. Our number one priority : a trustful relationship with building managers. We shall warn you every time we spot something out of the ordinary (dampness, lift out of order, electrical defaults…). Stability in our teams and regular feedbacks are two other assets.